The SmartRecruiters mission is to connect people to jobs at scale. How? By providing the technology platform and professional partnership companies need to achieve Hiring Success. SmartRecruiters offers a Talent Acquisition Platform that candidates and hiring managers openly embrace and recruiters love. Companies can rest assured that with SmartRecruiters, they have the partner they need to attract, select, and hire the right talent, on-demand and on-budget. The Talent Acquisition Suite is everything an organization needs to create Hiring Success and spans the entire talent acquisition funnel from initial candidate attraction to receiving the accepted offer letter. Everything is in one place, so there is no need for bolt-on applications that confuse candidates and frustrate employees. At SmartRecruiters, we break down the recruiting process and the tools needed to support it into three main areas: Attract, Select and Hire. Attract: Creating a compelling candidate experience starts with who you want to attract and why they would want to work for you. This helps to outline not just your message, but the tools you will need to source, market and convert available talent into interested candidates and proponents of your brand. Capabilities to support your marketing efforts across all channels include: direct sourcing to grow your list of potential candidates, talent pools to nurture communication with candidates, a drag-and-drop site builder to easily build and implement career sites, and our one-click apply process to optimize your conversion rates. Select: Companies that have collaborative hiring teams with clearly identified processes really shine here, especially when they’ve partnered with their recruiting teams. The key is consistent communication throughout the process—whether it’s a hiring manager providing interview feedback via the mobile app while running between meetings, or a recruiter having the ability to quickly schedule follow-up interviews with a few clicks. A team that works together efficiently and with clearly identified specifics of what they’re looking for will make higher quality selections. Teams can engage with assessments, video interviewing, screening and more to increase productivity for recruiters and consistency for candidates. 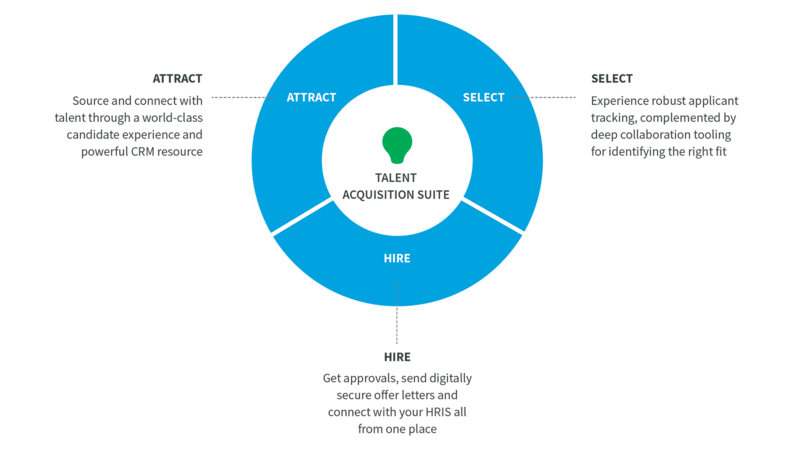 Hire: Managing the last few steps of the hiring process is easy when you’re using the SmartRecruiters platform because you can incorporate approvals and access all the vendors required to connect candidate information with your HRIS. This enables seamless integration along with tracked communication to ensure no data is lost as you begin the onboarding process. Once you’ve finalized the hire, you can calculate all your Hiring Success metrics by using the data you’ve captured along the way. Attract: Sourcing through tools like LinkedIn Recruiter, CV databases, browser plugins, auto-matching and more, including: job boards both mass and niche, pay-per-click job advertising, and distribution through Facebook and Google. Select: Tools to assess personality, culture fit, skill level and more can be found here. These help to vet candidates and further validate a high quality hire. Hire: Vendor partners for reference and background checks are available to help ensure your candidates are exactly who you’re looking for. You can even incorporate offer management and e-signature steps into the process. Once you have these, you can capture all the data for your new candidates and their roles to quickly get them started with onboarding integrations. Tech: Options include partners for SSO, Analytics / BI Connectors, HRIS and mobile apps. These make it secure and seamless to capture data and connect with your HRIS. We support ongoing innovation through our developer program so that apps and integrations can be built on top of the platform whenever needed. HRIT teams love us! Modern: The foundational elements for our Integrated Talent Acquisition Platform are simple but so important: Cloud-based and globally hosted for industry-leading uptime with open APIs to support innovation and integration with vendors and all HRIS platforms. We’ve achieved ISO 27001 certification for best-in-class security so your candidates can trust you with their information. All this and mobile apps to support your teams whenever and wherever they need to work. Flexible: Our platform helps you connect with candidates in local languages while letting your teams work in the language they’re most comfortable. It configures to your hiring process so you don’t have to train your teams on a whole new approach. It helps you maintain compliance in recruiting wherever you hire. It can configure quickly if needed and is purpose built for recruiting, not cobbled together from disparate systems. All this lives within a single platform that is easy to navigate and manage. Smart: Being able to use a platform not only in the way it was intended, but as a tool to manage the performance and capacity of the team and the candidates in the pipeline means the more you use it, the better it becomes. It provides a dashboard of analytics, builds reports and measures the metrics of Hiring Success. The foundation of the platform is a layer of intelligence that supports the ability to measure and manage the data within it, creating insights and predictive analytics to capture the impact your talent acquisition function truly has on the organization’s performance. By doing your work in the system, you actually create the data for reporting and analytics. This minimizes data entry by supporting the natural business workflows so you’re not a slave to the system.